A few months ago I got a question from one of the members from my done-for-you meal planning service I call ‘Soupstones’. Tonight’s dinner was divine: The Satay Curry from Soupstones (meal plan) 99. MUST make it again! Anyway, tonight’s plan was actually Italian Sausage Supper + Divine 4 Ingredients Cheesecake. Can I cook them in the oven together, even though one is 170 and the other 200 degrees celsius. Are there guidelines i can use as dictate what can be cooked in the oven, and what temps? My answer was yes you can absolutely cook them in the oven together. Best to set the temp to 170C to make sure the cheesecake is fine. And expect the sausage supper to take longer than the recipe. As I responded to Bella, I realized I haven’t ever written about oven temps here on Stonesoup. So it’s time we changed that! Things cook faster at higher temps. Of course you already knew this. So if you need / want to cook something in a hotter oven you expect it to take less time and start checking earlier. Where it gets tricky is for larger pieces of meat or baked goods like Bella’s cheesecake. If the temperature is too high the edges will start burning before the middle is done. So in Bella’s case I’d choose the oven temp to suit the cheesecake and let the sausages just take longer to cook. Most savoury dishes are flexible with temp. Cooking sausages at 170C (325F) instead of 200C (400F) isn’t going to make a huge difference apart from the time. Most sweet baked goods aren’t so flexible. Two reasons for this. First as I mentioned above is the potential for uneven cooking (burnt edges). The second is that baked treats tend to have a smaller window of time between ideal and under or over baked. Another reason to prioritize the cheesecake. It’s OK to use different temps to the recipe. Just expect the timing to be different and you’ll be fine. Generally fan assisted ovens will cook quicker. Which is why most recipes will tell you to reduce the set temp by 20C / 50F with fan ovens. The theory is the fan moves the air in the oven to redistribute the hot air that rises so you get more even cooking. A fan definitely helps so I pretty much always use the fan but still find some unevenness with my current oven. Some ovens are fast and some are slow. Having lived with many different ovens over the years I’ve found some ovens just tend to run ‘hot’ and cook things quickly. And of course others are slower. Use the middle shelf when baking. Just so you’re more likely to get good air circulation around your baked treat and therefore more even baking. Oven thermometers aren’t worth it. I’ve tried a few different ones and they tended to cause more trouble than their worth. Falling over and generally getting in the way. I prefer to just use the oven settings and go from there. After all the aim is to have properly cooked (and delicious!) food. There aren’t any prizes for baking at exactly 180C for exactly 30 minutes. Although if your oven doesn’t have any temperature markings on it (and I’ve lived with those) a thermometer can be helpful. It’s simple. Use the set point for the most delicate item or for the one with the lowest temp. And expect the other item to take longer than normal. I’d probably put the more delicate / lower temp dish on the lower shelf as well. 100C / 200C – super slow cooking for meats etc. similar to a slow cooker. 180C / 350F – for most baked goods, cookies, cakes, pastries etc. 200C / 400F – for cooking everything else. Roasting veggies, fruit, cooking baked dishes (like the moussaka below) and reheating food. 250C / 480F – aka ‘cranking it’. For pizza, fast roast fish and times when I’m running super late. Or got another question? I’d love to hear from you in the comments below! 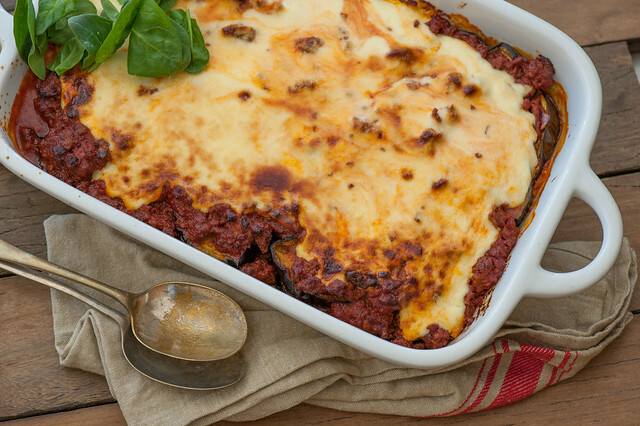 I’ve never really thought about moussaka until recently when I was craving lasagne but wanting a low carb alternative. The only downside is that like lasagne this is a bit time consuming but I’ve kept it as simple as possible! 1. Preheat your oven to 200C (400F). Slice eggplant about 1/2 inch (1cm) thick. Place on an oven tray and drizzle generously with olive oil and sprinkle with salt. 2. Roast eggplant until really soft – about 30 minutes, turning about half way. 3. Meanwhile, brown meat in a hot pan with a little oil. Then add the tomato and simmer for 10 minutes or so. Taste and season with salt if needed. 4. Cover the base of an oven proof dish with the meat. Layer over the cooked eggplant and top with remaining meat. 5. Mix sour cream and Parmesan then spread carefully over the top. Depending on the size of your dish it may not completely cover so I leave some space around the edges (see photo). 6. Bake 200C for about 15 minutes or until hot and bubbly and browned on top. Serve with salad on the side. vegetarian – replace beef with cooked lentils or beans. dairy-free – replace the sour cream and parmesan with a few handfuls almond meal or soft bread crumbs. Scatter over the top to give a lovely crust. vegan – combine the vegetarian and dairy-free options. more veg – feel free to layer in other cooked veg like roast zucchini, capsicum (bell peppers) or mushrooms. carb lovers – add in a few layers of lasagne sheets and expect to cook for longer. Yes. Enjoy your simple “get comfortable with thinking for yourself” cooking tips like this! Great post. Thanks for the hints Jules and the recipe. Will swap the eggplant for zucchini but it sounds both healthy and yummy. Hi Jules, thanks for the oven tips. I have another question (feel silly for asking this) but when you cook a sweet and a savoury together in the oven at the same time, like the sausage supper and the cheesecake, will the cheesecake take on a sausage taste? That was an important question at the Smeg training…..the answer is “NO the flavours don’t usually transfer. Mind you, I probably wouldn’t cook a garlic pie at the same time as a lemon meringue! Hi Jules – I have a kid who won’t eat eggplant and doesn’t like zucchini all that much either. So I do one third of the casserole dish with sliced potato or mashed potato if I have it in the fridge. The other two thirds is eggplant moussaka as usual for the adults. That’s a great idea. Mine’s not super keen on eggplant either. OMG – same here – why are these two veggies so loathed by kids and teens? Bizarrely – if I grate either of them the teen will eat it up without a comment – as long as it is in a dish like this or a tomato sauce etc – not solo. I think it is the texture of both that irks him as they are similar on the soft/mush front. Try it and see – you never know?!!!!! This is useful, thank you. On another note, I wonder if you have many interesting dairy, gluten and nightshade free recipes? Of course, there’s the good old stew (no potatoes or tomatoes etc.) and trusty stir-fries, but as the weather cools I’m looking for more comfort food options. Anything up your sleeve? In a previous life I was a kitchen appliance salesman. The Omega/Smeg suppliers provided hands on training which involved cooking. At the class that I attended there were around 15 participants and the exercise/demonstration was to prepare and cook main and sweets for all 15 in one oven at the same time. The oven used was a basic 600 mm, 3 shelf and fan forced model. As you can imagine, the thing was packed but, boy, the food (roast meat and veg were superb. If you use the baking trays that came with your oven you’ll maximise the space. Thank you so much, Jules (and Bella). I’ve often wondered about oven temps and had chosen to use a mid-way temp of 375F when cooking a 350F dish with a 400F dish. Now I know better. Plus, I used to use the lower shelf rack, thinking closer to the oven element was hotter. :( Thanks again for this info. This is some super helpful information! I’ve always been a bit unsure about oven temps but from now on I’ll know what to do. Thank you!! 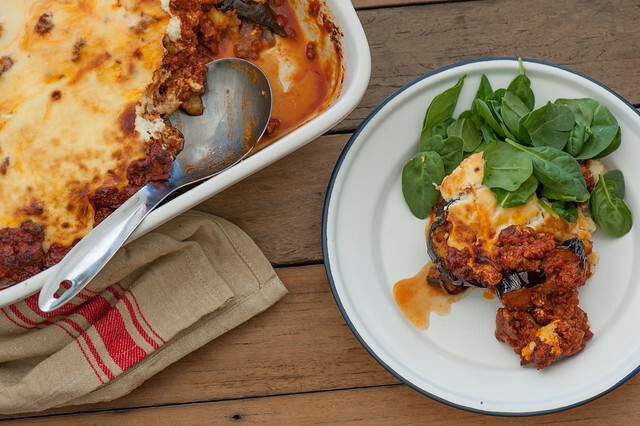 Also, that Moussaka looks divine – gotta give it a go! I was going to cook moussaka tomorrow eve but will now use this recipe. Saves having to make a white sauce to go with too. Greetings, found the blog interesting but as I have an Aga, not really useful! Recipes that say ‘put on the middle (or top, or bottom) shelf for x amount of time have always stumpted me, as middle of the oven is Gas mark 5/6 (sorry, never had an electric oven), top is mark 8/9 etc. One day we may move and have a normal cooker! I can juggle most temperatures that are reasonably close, but I find the biggest challenge is slow-cooked roasts with roast potatoes. because the difference in temperature requirements is significant. I cook the meat very slowly at about 160 F because that’s what it needs, but the potatoes are best at high temp. I can’t quite cook the spuds in the resting time after I take the roast from the oven. Beautifully written, really thought provoking. In India you can get health products at affordable rates on Easy Medico (https://easymedico.com). Yes, very helpful. My oven cooks very unevenly, so sometimes I have to rotate things halfway through. Also, the gas company seems to give gas that delivers different BTU’s from day to day! Not at all helpful. Lovely photo of young Finbar. This is really good to know! Thank you so much for sharing this. Thanks Jules! I wonder, if substituting the eggplant with mushrooms, (if eggplant is out of season) would mushroom need prior cooking? (I did try a quick and unsuccessful Google on this!).. I made this Wednesday and it was delicious and even more delicious the day after! I replaced sour cream with a fermented oat based creme fraiche to make it dairy free. Thank you Jules! Glad you like it Debbie! Glad you and your guest enjoyed Annik! Found the advice very helpful ! I know you posted this recipe last year and I’m finally getting around to making it! ( You’re post on FB the other day reminded me of it), but I just wanted to note I added a few teaspoons of ras el hangout to the meat mixture as every time I’ve had mussaka in the past it’s always had a hint of spice, so as it’s baking in the oven, it smells wonderful and can’t wait to take a bite! Oh! And I wanted to add my grocery store here in the US has finally started carrying a proper tomato passata! I was so excited since I’ve been following your blog for years now and have never been able to find that ingredient until now! I’ve done a moussaka with a cauliflower béchamel this week. Seriously yum. I have used this base recipe and changed the eggplant for thin slices of uncooked pumpkin. It takes a little longer to cook, about an hour, so I put the sour cream topping half way through. Might take longer to cook but much easier than having to cook the eggplant first. I have always been unsure of the term “slow oven”. Just what does that mean? Is it 325 degrees or 300 degrees? When baking a new recipe this term in confusing! To be honest I think a slow oven can be anywhere between those temperatures Mary – I’m not a fan of vague terms like that so always include the exact temp with my recipes. Great question though! I am making a crown roast of pork that requires a 325 degree oven. It is accompanied by a dressing that requires a 375 degree oven uncovered for an hour. If I bake them together at 325 how long do I need to bake the dressing? Also, should it be covered? I’m sorry I can’t really say for sure without seeing the recipe. But as a guess I’d leave the pork uncovered unless it starts to brown too much. And I’d expect the dressing to take 90 minutes – but best to just check every 15 minutes or so.